He was lying in a first class compartment of the Paris-Marseilles express, his throat cut from ear to ear. The only other occupants of the carriage were a blind man and a gentle old lady of eighty, who was hysterical from shock. 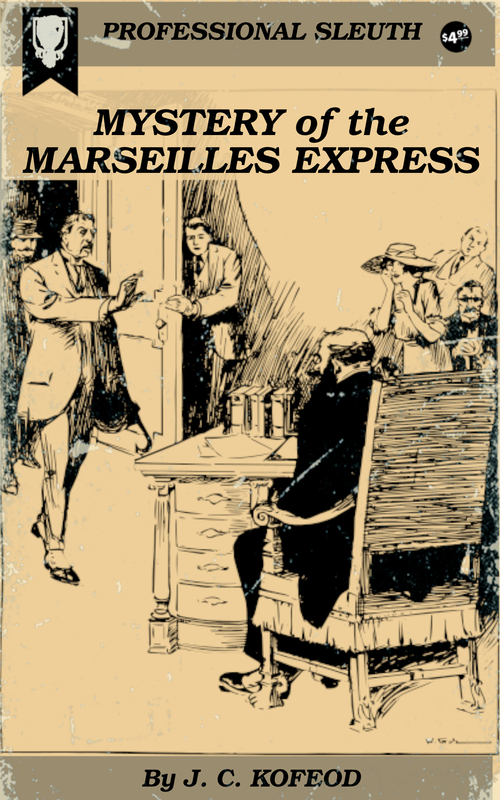 He was lying in a first class compartment of the Paris-Marseilles express, his throat cut from ear to ear. The only other occupants of the carriage were a blind man and a gentle old lady of eighty, who was hysterical from shock. The Rue Cannabiere is at once the Broadway and the Boulevard des Italiens of Marseilles, and it is more cosmopolitan than either. Between the big stores, the glittering cafes, restaurants and theaters that flank its width, walk yellow men from China, brown from India, black men from Bermuda or the Soudan, Arabs, Portuguese, Italians and Yankees. Turban and fez are as common on the Cannabiere as silk stockings and painted lips. William F. Bailey, special agent for the Department of Justice, sat in a corner of the Restaurant Haxo, absorbed in a magnificent omelette and a cup of chocolate. The warm June sun sprayed through the windows, lacing floor and furniture with thongs of gold. From the window he could see the Vieux Port, with its bristle of masts. His unopened copy of the Matin was propped against a cruet on the center of the table. Bailey had been in France a year, seeking “Beau” Nash, who was wanted in the United States on a dozen charges. Nash was of the highest type of criminal, but a man who had made enemies gratuitously. He kicked out of his path men who had enabled him to make a success of his nefarious calling. But even with information from a number of these Bailey had been unable to trace the old fox. “Railroad” Cartwright had failed to “get” the Beau in his day—failed, with a great incentive to urge him on; and so had a dozen others. He had had a year, and from all indications was no closer to his quarry than when he started. Well, if Denise Girard, whom he loved, married him, Bailey could hardly call his European trip a failure, even though it might seem so in the eyes of his superiors. The little man sprang up, with a snarl at the edge of his lips. Then he glanced around, hesitated, and after a moment slouched out. Bill yawned, and picked up his paper. In a flash his bored air dropped from him, and he stiffened with amazement. It was not the headlines telling of the death of Monsieur Bertal, but the fact that the dead chemist’s photograph was that of Beau Nash! It required just two minutes for the agent to pay his bill and leave the Restaurant Haxo. The Prefecture of Police was only a short distance away, but fifty Frenchmen shrugged their shoulders and exclaimed anent the mad hurry of Americans as Bailey dashed by. The prefect greeted him politely. Of a certainty the body was in the mortuary, and if Monsieur Bailey desired to view it there could be no possible objection. It also happened that the two occupants of the compartment at the time of the murder were in the prefecture, and it would be possible to speak with them. It was hoped that the distinguished American secret agent might aid them in this case. Bailey followed a glum gendarme down a corridor to the room where the unfortunate flotsam of the city so often paid their final visits. There was something on one of the slabs—a rigid something covered with a white cloth. The agent turned down one corner of the sheet, and then replaced it. His search was ended. The lean face and drooping mustache, the graying yellow hair—It was Beau Nash beyond a doubt! “You recognize him, monsieur?” asked the prefect, who had followed Bailey into the mortuary. Madame Berthier, a delicate little lady of eighty, told Bailey, in a frightened voice, all she knew of the affair. No one in their senses could have suspected her, but the frightful experience had shaken her to the soul. She stopped, and covered her face with her quivering hands. Once more on the Rue Cannabiere, the American paused. He would probably be ordered home very shortly, and in the short time left him he would have to persuade Denise to marry him and accompany him to America. Though he had known the girl for almost a year, he knew little or nothing of her family and antecedents. She was very beautiful, apparently had sufficient money for all her needs, was well educated and well bred. Also, she found it necessary to make trips to Paris every two weeks. That completed Denise Girard’s dossier so far as William Bailey was concerned. It was sufficient that he loved her. He walked as far as the Cours Saint Louis. There he swung aboard a tramcar, and after fifteen minutes’ ride dropped off opposite the marble grandeur of the Palais Longchamp. Denise’s apartment was very near. Pondering there in the June sunshine as to the best course he should pursue, Bill Bailey received the greatest shock of his eventful life. Denise came down the steps of her house, arm in arm with Beau Nash! The drooping mustache, the graying yellow hair was that of the corpse who lay on the slab in the mortuary of the prefecture of police. And who could doubt from the stately and dangerous walk, from his eyes—so ice-cold, so fire-hot—from his deadly air of a bravo of fortune, that Nash was very sure of himself. Apparently the pair did not see him. They walked down the street, talking earnestly. Bailey shook off his numbed surprise, and followed them. A question kept hammering in his brain. What was Denise doing with the Beau? What possible connection could his little sweetheart have with the most notorious criminal in Europe?